Jacky Cheung is invited to perform on 2012 Spring Festival Gala, the nation’s biggest festival gala to celebrate the traditional Chinese New Year and Spring Fest. Singers are considered very honored to be invited by the CCTV Spring Festival Gala Council, but due to previous years’ schedules conflicts. Jacky has never been able to make his first Spring Festival Gala appearance; however, the good news is – he finally managed to make time this year. The CCTV board has so far kept it a secret in terms of which song Jacky Cheung will be performing for the Spring Festival this year. Editor’s note: Jacky Cheung recorded 5 songs from Roxanne Seeman including “Everyday is Christmas”, “ Lucky In Love”, “Double Trouble”, “Let It Go”, and “Which Way Robert Forest”. Some Of these songs were also featured in Jacky Cheung’s 1/2 Century Tour all over the world. In 2012, Yang Kun joined the hit competition show broadcasted on ZJTV “The Voice Of China” and he is one of the four judges on the show. “The Voice of China” caught national attention immediately following its debut and continue to be a national sensation for this first season. YangKun appeared as one of the four judges, who are all considered as the top singers in China. This show has brought Yan Kun much media exposure this year. He also expressed his interest in continuing being the judge for the show. Editor’s note: Yang Kun recorded Roxanne Seeman’s song “ Hui Bu Hui(Will We)” in 2011, and this song also became the theme song for the movie “ Lost in Panic Cruise”. Lost In Panic Cruise, released in 2011 is the sequel to 2010’s Lost In Panic Room. This film is regarded as the first attempt in Chinese movie industry of exploring Thriller/Crime/Mystery genre film in Mainland China. It received incredibly high audience reviews and has yielded 1.5 million RMB in box office. The production company of our film is Bei Jing Cheng Shi Hua Dui Dian Ying Dou Zi Guan Li Co., LTD (北京盛世华瑞电影投资管理有限公司, one of the top film production companies in China. It produces 5 to 10 movies each year and has produced some top-gross films include IP Man, Painted Skin. Many of its film productions are of A-list actors and directors in China, yielding up to 1 billion RMB in average in box office performance (such as Yip Man and Painted Skin)! Lin Yu Chun caught world attention when the YouTube video od his contest performance of “ I Will Always Love You” went viral, with 12 million views. He was signed by Sony, releasing his first album in 2010. Lin Yu Chun has been called Taiwan’s Susan Boyle. He was invited to appear on the “ Ellen DeGeneres Show” in the US. Editor’s note: “Saving Grace”, written by Roxanne Seeman, Philipp Steinke and Finn Martin, is the opening song on Lin Yu Chun’s second album, released November 2011. Allen Su is New Generation in the Chinese pop world. A runner-up in the 2007 Super Boy contest, Allen Su was signed by Sony Music. Allen Su’s influences are international. He has spent time living in Australia and is a big fan of R&B music. Su’s debut album “Long.Ing” has had a big impact on Mainland China. Editor’s note: “When You Hear This Song”, written by Roxanne Seeman and Daniel Nitt, is one of the most popular songs from “Long.Ing”, as attested by postings of Allen Su’s fans on “Baidu Forum”. In 2010, Taiwan CETV named Amber Kuo one of the top ten TV stars in Asia. She won the Budding Actress Award of the 12th Taipei Film Festival in 2010. “Arrest Me”, written by Roxanne Seeman Robin Grubert & Ali Zuckowski, is the hit song from Amber Kuo’s 2010 album “Sparklers”. Linda Chung is a leading Hong Kong TVB (Television Broadcast Limited) actress/singer. She has appeared in more than 10 TVB dramas and won the Astro TV Award for Most Favorite TV Character, 2010. Linda Chung was born in British Columbia, Canada. She won Miss Chinese International in 2004. “Cha Cha Cha”, written by Roxanne Seeman, Kine Ludvigsen, and Olav Fossheim, is a hit from her “My Love Story” album. Rainie Yang is a leading Taiwan singer/actress. She won the forty-fifth Golden Bell Award for Best Actress in the TV show “Hi My Sweetheart”(Hai Pai Tian Xin). “Tick Tock”, written by Roxanne Seeman, Kine Ludvigsen, and Olav Fossheim, is the theme song of “Hi My Sweetheart”. Stephy Tang is a leading Hong Kong singer/actress. She was formerly lead singer of the pop group Cookies. Stephy has released over 10 albums and appeared in over 26 films. “No One Knows”, written by Roxanne Seeman, Kine Ludvigsen, and Olav Fossheim, is the single and title track of Stephy Tang’s August 2010 EP released by Gold Typhoon. Miss Universe China Pageant beauty contestants dance to Tick Tock by Tick Tock Team. Tick Tock, written by Roxy Seeman, Kine Ludvigsen-Fossheim, and Olav Fossheim, is the English version of Rainie Yang’s hit Chinese song Qing Chun Dou. 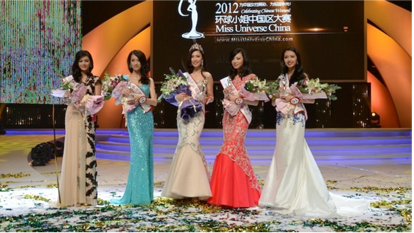 Yue-Sai Kan introduces Miss Universe China Pageant 2012, premier fashion event of the year, with beauty contestants from 7 rovinces and 19 cities. Yue-Sai Kan gives special thanks to Roxy Seeman for the opening song of the event.